On this blog, I have often written about the importance of progress. I view progress as crucial for finding meaning and gratification in life although I admit there may be some less attractive sides to progress). Also, I have written about the motivational impact of progress (see for instance this post and this post). Is there evidence of the motivational impact of progress? Now, there is. Teresa Amabile and Steven J. Kramer have written the book The Progress Principle: Using Small Wins to Ignite Joy, Engagement, and Creativity at Work in which they report on a large scale study into worker performance and motivation. This multiyear study tracked day-to-day activities of 238 people in 26 project teams in 7 companies in 3 industries. The study examined the relationships between workday evens, inner work life (the perceptions, emotions and motivation of the individual) and individual performance (creativity, productivity, work commitment, and collegiality). 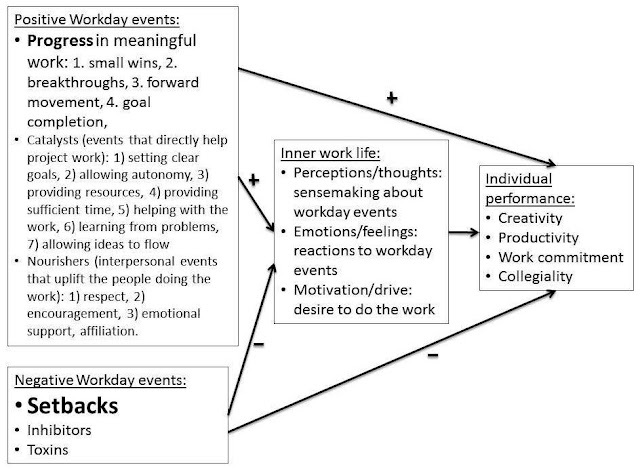 The primary finding of the study was that three types of events had the most positive impact on work life and performance: 1) progress in meaningful work, 2) catalysts (events that directly help project work), and 3) nourishers (interpersonal events that uplift the people doing the work). Of these three factors, progress was by far the most powerful. The negative opposites of these three factors (setbacks, inhibitors, and toxins) had negative effects on worklife and performance. Their effect turned out to be much stronger than that of the positive factors. Even small progress and setbacks often had strong effects on inner work life. What do I think? Well, to be completely honest, I started thinking about World of Warcraft and the team roles in approaching a dungeon. This somehow resonated with the healer role (I have a healer) and with the various adaptive actions required in complex fights where the team has to deal with direct damage, AOE (Area of Effect) damage and curses. When there is a fight with a very powerful boss and the team just clicks with the Tank keeping aggro, the DPS handling the adds and the healer making sure everyone's health is OK, the satisfaction of wining the fight is AMAZING. "Managers may be unaware of how important progress is to human motivationi, but it's The secret that every good videogame designer knows. Of all entertainment forms, videogames are among the most addictive. People, especially young men between the ages of fifteen and thirty-five, spend enormous amounts of time and money to stay immersed in fantasy worlds like the massively multiplayer online game (MMOG) World of Warcraft. What keeps them hooked? To a large extent, it’s two things: constant progress indicators and achievement markers. Both leverage the progress principle. Playing WoW brought me a lot of insights into motivation, engagement and cooperation.